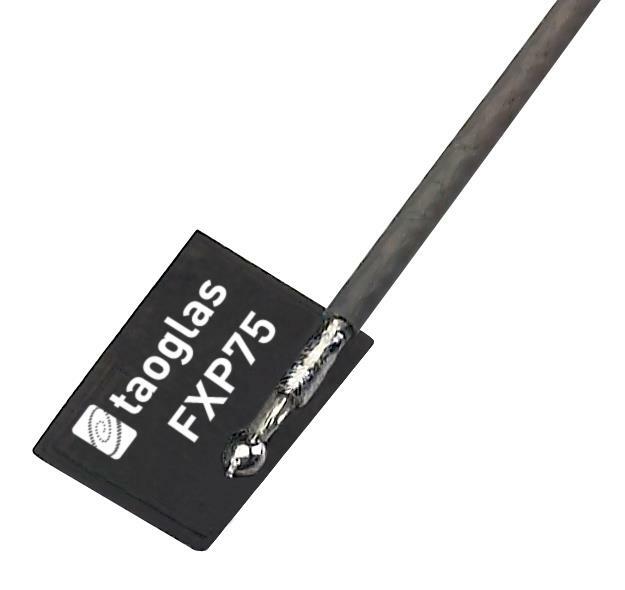 The FXP75 Atom is a super small monopole ultra-low profile antenna for 2.4GHz band that includes Bluetooth, Wi-Fi, ZigBee and ISM bands application. The FXP75 has a peak gain of 2.5dBi at 2.4GHz and efficiencies of 45%. This Taoglas patent pending antenna is unique in the market. Two years of constant research and development have created the world�s smallest coax cabled true 2.4GHz antenna. Made from poly-flexible material, the antenna has a tiny form factor of 5.9*4.1*0.24mm and has double-sided 3M tape for easy "peel and stick" mounting. The cable routes conveniently directly out of the bottom of the antenna, reducing the volume the antenna takes up in the device to an absolute minimum compared to other designs. The FXP75 is the ideal all-round antenna solution for fitting into narrow spaces and still maintaining high performance, for example in a Bluetooth earphone where metal and electrical noise degrades onboard SMT antenna performance. The FXP75 is small enough to be routed away from metal and electrical noise to deliver much improved range and reliable sound quality in Bluetooth earphones. Many module manufacturers specify peak gain requirements for any antennas that is to be connected to that module. Upon testing of any of our antenna with your device and a selection of appropriate layout, integration technique, or cable, Taoglas can make sure any of our antennas peak gain will be below the peak gain requirements. Taoglas can then issue a specification and/or report for this selected WiFi antennas in your device that will clearly show it complying with the peak gain requirements, so you can be assured you are meeting regulatory requirements for that module. It is better not to select an embedded antenna with very low free-space peak gain (<2dBi) directly, as this antenna would have worse performance in your device, and lead to compromised performance compared to using a Taoglas antenna.